1 of 4 Combine 1/2 cup of the dressing with the chicken in a large resealable plastic bag. Let stand for 20 minutes. 2 of 4 Meanwhile, toast almonds in a 10-inch nonstick skillet over medium-high heat for 5 minutes, stirring often. Remove to a small bowl. 3 of 4 Coat same nonstick skillet with nonstick cooking spray. Remove chicken from marinade; add to skillet. Cook over medium-high heat for 7 minutes, turning, until cooked through. Cut into bite-size pieces. 4 of 4 Drain Mandarin oranges, reserving 1/4 cup juice. Whisk juice into remaining 1/2 cup salad dressing. 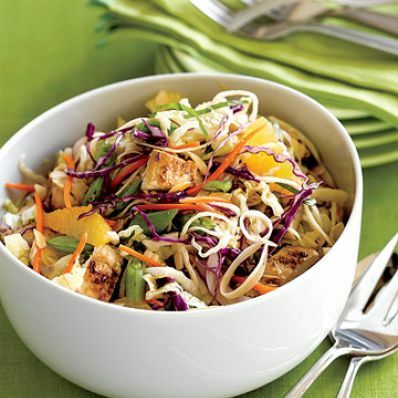 In large salad bowl, toss cabbage, sugar snap peas, basil, scallions, cole slaw mix, salt, pepper and chicken with dressing. Add Mandarin oranges and almonds; gently stir to distribute. Serve immediately. Per Serving: 33 g pro., 364 kcal cal., 849 mg sodium, 7 g fiber, 10 g Fat, total, 34 g carb., 1 g sat. fat, 66 mg chol.